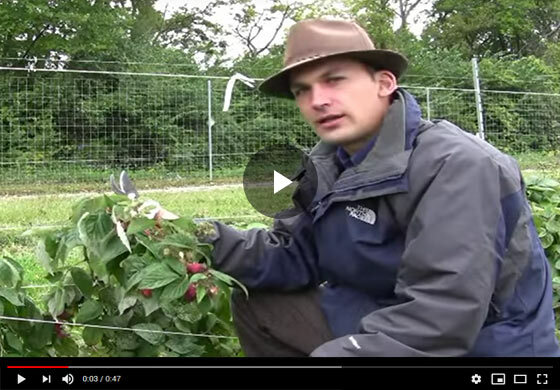 Felix, Gurney's horticulture expert explains the fruiting habit of Primo Cane or everbearing raspberries, explaining how you can have one, or two crops per season by altering your pruning practices. Hello, I'm Felix with Gurney's, and today I wanna talk a little bit about brambles, particularly raspberries here, they're Primo Cane fruiting. These are raspberries that will bear on the first year cane and that's what the prime means, one, and the cane, so Primo Cane fruiting. You'll, also see these, and I think we refer to them as everbearing raspberries. So, what we're looking at here is a cane that grew this year and right now it's fall, it's early October and this is, happens to be Caroline. It's a nice red variety. So the cane I'm holding grew this year. It started fruiting at the tip and that's where the fruit production is that we're seeing right now, is that the tip of the cane. There are about six buds that send out a fruiting cane. So if you look here at this hand, there's a petiole with a leaf attached and then there's a bud that broke and that bud send out a shoot that has fruit production on it. These were flowers earlier then they'll ripen up. These look green right now but they'll ripe up to red color with the fall. This will go on until frost and then they'll stop. So this one's been bearing for us for about three weeks now. So you got a nice fall production. If you leave this cane in the ground, next spring, lower down the cane, all these buds will break and those will send out those fruiting shoots. So that's an advantage. You get your early summer crop, and you'll generally get three or four weeks of fruiting where it's ripening in the summer, early summer, and then you'll get new shoots that have come out in the spring that will fruit again that fall. And if you hold those canes over, you'll get lower fruiting again in the early fall. So it's really a double crop, there's a little break between the two crops, hence the everbearing, is that you get constant fruit. There's another way to deal with these. Most of your raspberries have a few thorns. Caroline just has some minor thorns on it, there's really not a big problem, but if you can just have the fall crop and that entails cutting your canes down in the fall, so after the frost and after the canes have gone dormant, you just mow them down with a mower. In the spring, you'll get new shoots that will grow throughout the year into their early fall, late summer, you'll get your fruit in the season. It makes maintenance a lot easier. You just mow them and you just get your fall crop. If you let them fruit twice, you also get a little bit of productivity reduction because this energy, instead of just going into a heavy fall crop, is going into two crops. So the cane vigor and the amount of food production is reduced a bit, but you do get the season extension.